Even after all these years iTunes is still an essential application for purchasing and playing music for many. Because of that SongKong and Jaikoz have always supported automatic notification of your iTunes library as you make changes to your music collection. This is necessary because unlike other software iTunes maintains its own model of everything known to iTunes but does not actively monitor your file system for changes made to your songs outside of iTunes. For example if you rename a song that is already in the iTunes library without informing iTunes then it will not be able to find that song next time you try and play it. If you delete a file because it is a duplicate without informing iTunes then it will remain in the iTunes library as an orphaned file. Unless you add new files to iTunes it will be unaware of them, but if you add a file already known to iTunes as if it is a new file you can get duplicate files within iTunes. We have now made some important improvements to SongKongs iTunes integration. Previously iTunes was notified once after all songs had been saved, if a large number of songs were modified this could cause a delay at the end of Fix Songs as SongKong created an iTunes playlist of all the songs modified. Now we add songs to the iTunes playlist as they are saved, this avoids the delay at the end and also means that if SongKong encounters a problem before finishing details of all songs so far modified are sent to iTunes. In order to update iTunes SongKong has to create a presentation of the iTunes model so that it knows the names and locations of all the songs under iTunes control, this is done once every time you start SongKong ( if you have iTunes integration enabled). 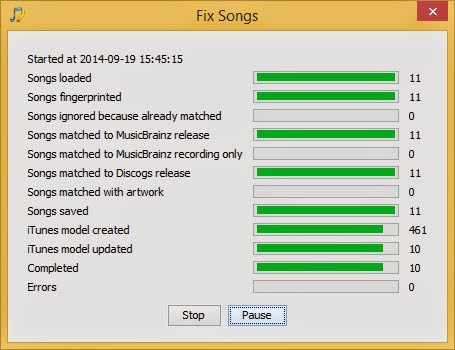 If you have a very large iTunes collection this can take a while, and if you are only matching one album in SongKong then building of the iTunes model can take longer than matching the album but there is no indicator in the progress bar to indicate this so it can look like SongKong has stopped working. Updating also used to happen at the end and this could an additional delay, once again there was no progress indicator to make this clear.